Few people are ever totally content with their homes. It could just be that the living room never has enough comfor­table chairs, that there is not enough storage space in the kitchen or that the yellow gloss paint you used in the bath­room is beginning to chip. Maybe you are not even sure what is wrong, but something always bothers you when you enter a certain room. To help you work out how you intend to improve your home study photo­graphs of rooms. Think what it is that appeals to you. Is it the fabrics used, the style of the furniture, the mixture of patterns, the simplicity of colour or the softness of the lighting? On the other hand, if it is the size of the room or the view from the window that appeals to you, you may have problems recreating something similar in your own home. It is always easier to plan a room from scratch around a painting, a rug, cur­tains or a collection. But where this is not possible, you can still make changes which will improve your home. The first step is to take a critical look around you. Be courageous. It may mean gett­ing rid of things you have had for some time. This is difficult decorating, but with a little thought your home can be beautiful too, and can work in the way you want it to. It is essential never to keep anything just because you do not want to hurt the feelings of the person who gave it to you. If you do not like it – or if it does not work in your home – either store it, sell it or give it away. Compromises may be what make life go smoothly, but not in decorating. A home will never be beautiful if it is filled with mismatched objects that you do not like. It is your taste that will make your home look right to your eyes, not your taste plus Aunt Joan’s and her Christmas gifts. By now you have probably developed a pattern for living in your home. You instinctively go to one room for cook­ing, another for sleeping and another for washing, but what about less obvi­ous activities? Where’ do you go for sewing, for practising the cello, for watching television, answering letters, paying bills or when guests come to dinner? 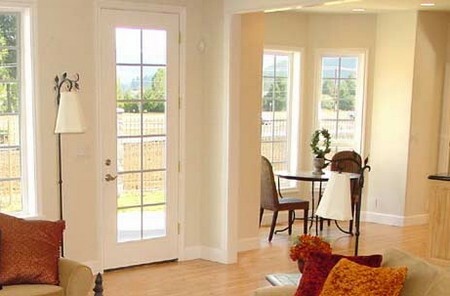 Often rooms, usually sitting rooms and dining rooms, do not work well because their functions are unclear. Think of the way you live in your home and make a list of all the things you do and where you like doing them. Then see if the rooms really work the way they are. Do not worry if the layout of your rooms is constantly changing. It is only in magazines that rooms look so immaculate. Most people alter their homes constantly and are forever push­ing a chair from one room to another or shifting the sofa around – so start push­ing and stop worrying. How do you feel when you are in each of your rooms and, more importantly, how do you look? It is essential that you both look and feel attractive in your home. If your wardrobe is filled with blues, yel­lows and greens then your home should be too. There is no point having a pink and brown home when you feel dowdy and depressed wearing those colours. Always hold carpets, fabrics, wall­papers to your face when buying; look in the mirror to see if they suit you. If you always dress very simply with straight, sharp lines and few frills it makes little sense to have a home clut­tered with lavish curtains, endless knick-knacks and floral patterns. Your home should mirror your style as well as your complexion. Look around you and decide whether you have been collecting things because you like them, because you need them or because you thought they would make your home look more fashionable. Never do anything to your home that does not feel right. You can never emu­late someone else’s style, so why try? Your home should reflect you and your style. If you do not like something that is in vogue this year then do not be influenced by it. This year’s fashions become last year’s quickly enough and then you are stuck with them. Have you got boisterous children and pets? If so, is an all-white room really ideal? Pale colours are soft, pretty and easy to live with – visually. They are not appropriate to a lively family home to which patterns or bright washable fabrics, such as corduroy, denims and linens, are far better suited. Your home should be designed to fit your life: it is no good pretending you are something that you are not. Delicate china or glass objects, for example, are incompatible with toddlers – unless you lock off a room and keep the children out. Are you using the right materials and colours in the right rooms? An expens­ive carpet in the nursery is a waste of money and a constant headache. Dark, sophisticated curtains in the laundry room are another unnecessary expense. Keep your head and spend money in rooms where you are going to appreci­ate rather than regret it. Does it suit the building? Try and complement the style of your home rather than ignore it. Do not take out period features, such as Victorian sash windows, tiny Tudor (or mock-Tudor) panes or beautiful fireplaces. Similarly, do not straighten floors, walls and doors that are crooked and uneven. All these things are part of the charm and character of your building and you should enjoy living with them. On the other hand, do not be tempted to add inappropriate features to your home. Putting a marble eighteenth-century fireplace (even if you have wanted one for years) in an Edwardian room does not work. The intricacy and frivolity of the Edwardian style of archi­tecture will be overpowered by the plain, cold, symmetrical marble – which in turn would look elegant and entirely appropriate in a Georgian house. In need of a focal point? 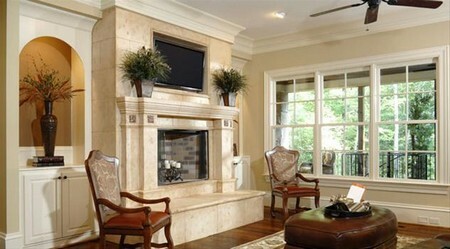 Could it be that what is wrong with your living room is that the main focus is the television rather than the fireplace? Does the seating area seem to have no coffee table or central rug holding it together? Or does the room lack a sinelc beautiful item, such as a painting, a grand piano or a stunning palm tree that everyone can admire? Features come in all shapes and sizes – and all price ranges. A wall covered with gilt-framed pictures painted by your child is as eye-catching a feature (although it may be not as good an investment) as the work of an old mas­ter. You may even feel that covering one wall with a stunning wallpaper is pre­ferable to having it blank. Why not make a low-level, built-in storage area stretching across the entire room, and cover it with cushions? It would be a wonderful seat or lounging area, a useful storage space as well as a spectacular feature. Or you could consider laying a second-hand parquet floor in your living room and covering it with rugs instead of a fitted carpet? Not only would it look unusual and be easy to clean but it would also be ideal for parties, when rugs could be removed. If you have any money to spare, spend it on essentials, not frills. It is easy to get carried away and spend too much on the first thing which catches your eye. But it is more important to think carefully about your priorities. A chest-of-drawers may cost more than a pretty lamp and shade, but it may be more essential to improving your room. The basics in a room must be right, so do not rush any decisions and always buy the essentials first. Once you have got these right, take your time to consider all your other purchases.